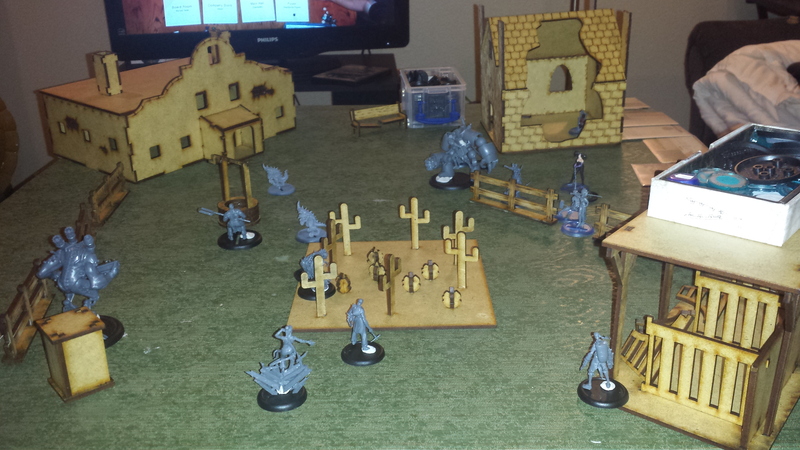 It’s Sunday, but my wife and I have already managed two games of Malifaux! Pitting the Viktorias against Mei Feng, the battles had the flavor of a truly incredible action movie. Swords bisecting bodies, kicks crumpling armor, and capering little fire monsters running around; I’d watch that! These were her first games using Hannah, a model we’ve had for a while, but only assembled recently. Getting the whole suit assembled ended up being a joint effort, with me tagging in to do the finger bits and so forth. This woman is the thief of joy. However, her impact on the games proved significant, so it was all worth it. Fitting her into the Viktorias list required cutting a couple of Ronin, though, which definitely changed how the force played. Mei Feng is among the models who got me interested in Malifaux in the first place, and the Rail Golem is probably the model. I love the Golem’s concept, and the rules are exciting and fun. I’m not as big a fan of the model itself, and it may be the first real kitbash I do in the realm of Malifaux. It has a great pose, dynamic and possessed of weight and menace; however, I don’t like how smooth and non-mechanical parts of it are. I definitely don’t think I am playing it to full potential, though. I love that the boiler spins up on Burning, but I’ve been very hesitant about actually hitting him with attacks that grant the effect. I should probably start firing on the Golem with my Fire Gamin (though I may swap those models out for Metal Gamin and see which I like better), which would also subject nearby foes to blast damage. Speaking of blast damage, Hannah’s melee-based blasts are brutal. 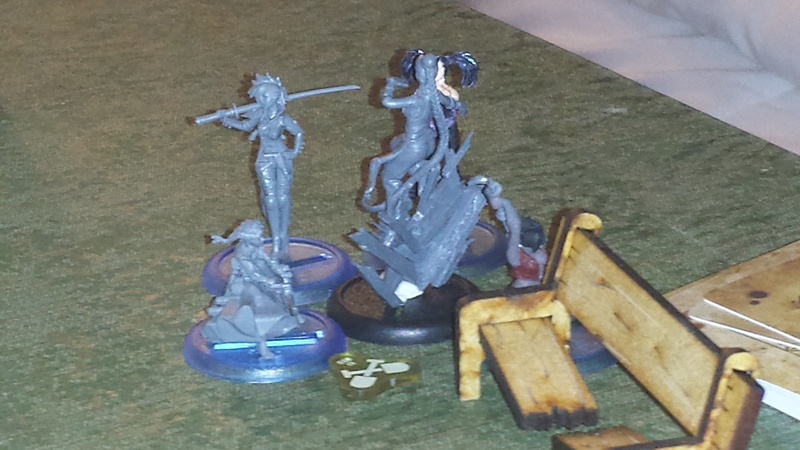 In the first of our games, she shut down two of my models with a single swing thanks to the Horror check it causes. Our first game came up Reckoning, Flank Deployment. I think I ended up with Spring the Trap and Outflank, though none of the schemes really came into play. As this was my first time playing Mei Feng, I mostly wanted to try out the toys she and her crew came with. Thus I probably got fancier with my deployment than necessary, putting her near the bottom of the table and then staggering my various constructs towards the north to set up a big Railwalker turn. In practice, I ended up Railwalking all the way to the north, then back to the center. This was inefficient, but felt really cool! Sometimes, as a grown adult man, feeling cool is its own reward. Once Hannah got into the ranks, it was rough. I was able to plink her a few times with Fire Gamin, but the blasts from her melee attacks paralyzed both Gamin. Kang was able to have a significant impact with his Taunt, though; the long-lasting effect of that ability, which forced a Willpower duel any time Hannah tried to attack someone else, was not popular. Because, when I say long-lasting, I mean we didn’t see any duration to the effect. That included the death or removal of Kang himself, which meant she couldn’t bury him to get quit of it. My Railworkers, meanwhile, wilted under the onslaught of the Viktorias, who worked their way in from the bottom of the map. Mei Feng and the Rail Golem served as a second wave against Hannah, while Vanessa blasted away. I realized with horror just how effective Vanessa would be against an almost-all-construct force. Buuut…it was here that the game came to a close, due mostly to the lateness of the hour. I have fewer pictures of Game 2, even though we played it to completion. It was our first Story game, and we drew Destroy Evidence, set in a Mine with Flank Deployment. Unfortunately for me, I got Defender on a Tome. This meant that in order to win I needed to wipe out all of her Leader and Henchman models; you may note that this gave me four vicious models to chew through. I took Gathering Power and Spring the Trap for my Schemes, and the former was the only way I actually managed to score any points. I started this match with Mei Feng along the bottom again, leaving my Emberling and Fire Gamin near the top. The intent was to take Mei and the Rail Golem to the right, while capitalizing on the synergy between Gamin and Emberlings to shoot it out with whatever my wife sent across the top. Kang was supposed to anchor this northerly assault…but I forgot to activate him on the first turn. My plan along the bottom worked better, though, with the Railworkers helping Mei Feng to Railwalk her way into position for an utterly ridiculous turn 2. Notice how the placement of my wife’s blue-based models leaves Mei no space to defensive trigger out of this scrum. That was no accident! I stand by my tactical decision, based on what I was facing. I saw a chance to assassinate Viktoria of Ashes; while it was likely going to cost me my leader, it was worth an extra point in the Strategy if my Leader wiped hers. Without Ashes, she’d have a far harder time executing the brutal Viktoria Turns where half the force descends on a single model, picks it clean, and then dances away. Also, I had the nut draw, with 5 of my 7 cards being face cards. Since we were in a mine, I was also sitting on 6 soulstones, thanks to tapping one of the ore veins. I also had someone in position to snag another one, so I was loaded to kill Ashes and escape. I charged into battle with a Jackhammer Kick, landing the hit for minimal damage. I wasn’t worried about getting high damage on the first attack, because I knew I had a full slate of swings left. I followed the kick with a Tiger Claw, using the Seismic Claws upgrade (and spending a soulstone) to trigger a Jackhammer Kick from that hit. Looking back, I wonder if I should have taken a burning trigger on this hit, in order to boost subsequent claws, but I expected to score some better damage through additional hits. Since the Seismic trigger pushed Viktoria back, and Jackhammer put me into contact again, I worked to her away from the rest of her crew. This did serve to further isolate Mei Feng, but anything that reduced the hits I took in return was welcome. Still on my first activation(! ), I employed the Jackhammer Kick trigger Intimidating Pose to grant Armor +1 to Mei Feng…only that’s not what it actually does! The Pose Trigger pulses, so Mei doesn’t benefit, meaning she had worse survivability than I expected. I still had one more AP, which I put into another Tiger Claw with soulstone for the Jackhammer Kick trigger. I managed to force my wife to spend all of her soulstones–starting at 3, due to tapping a vein of her own–on damage prevention, but my damage flips were very disappointing. I suppose I lost some focus, though, since my stated goal had been to suicide-run Viktoria. Once I was in the scrum, I became much more cautious, saving up soulstones for damage prevention. Throwing a few of them into positive flips would likely have gotten me the kill, and even with all her prevention Viktoria ended up at one wound. I also could have pulled Mei out with Railwalker after the charge, but my Rail Golem was exactly half an inch too far away for that maneuver. One activation into Turn 2 and we’d already had six attacks! 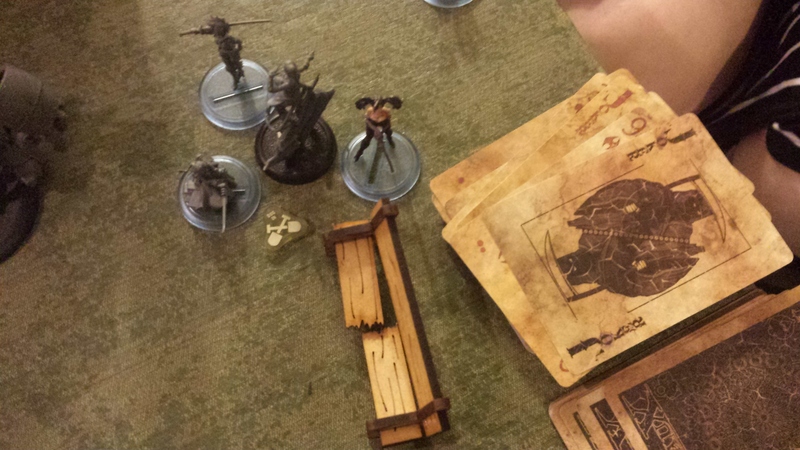 On my wife’s activation, she debated between healing Viktoria of Ashes and going all-out offense. She opted for the latter (it was a very bloodthirsty game!) and pitched Howling Wolf Tattoo to make her Ronin a Sister, then employed Dragon’s Bite to swoop in on Mei. Her hand wasn’t great and her flips didn’t help her, so she had to cheat to get the spell off. However, this is how we ended with the picture above, Mei Feng surrounded by both Viktorias, the Student of Conflict, and the now-sisterly Ronin. The resultant attacks cut through most of Mei’s health, and all of my soul stones. I had to soak the first few hits because I knew that at least two of her models (Ronin and Marked Viktoria of Blood) were going to ignore Mei’s armor. Luckily, my hand still had a ton of juice and her’s didn’t, so Mei dodged a few swings and stuck out the majority of the Bite, plus Viktoria of Ashes’ last AP. My Rail Golem threatened the scrum, so I considered sending him into the fight on my next activation. However, I still had my blood up about keeping Mei alive, so instead I moved the Emberling (a Totem without Insignificant, which is very nice) to tap another vein and thus give Mei some more damage prevention opportunities. Mei would have died much earlier in the turn if we’d remembered that Viktoria of Ashes grants Melee Expert to friendly Sisters. As it was, she managed to weather the next activation, when Viktoria of Blood triggered Dragon’s Tail to strike me with all of her Sisters again (including the Ronin). Tail has the option of letting models fly away after the attack, but my wife kept everyone but Viktoria of Blood tight on Mei. Blood did sprint away, potentially opening an escape route for Mei’s defensive trigger, albeit one that would only pin her against the table edge. But look at that guy! That sweet card of a guy! Viktoria of Blood fluttered away from the fight out of a desire to avoid the Rail Golem. Instead of coming into that battle, though, I charged him into Taelor. Taelor’s a terrible matchup for a construct, yes, but locking her in combat prevented her from contributing to the fight against Mei Feng. My wife then activated the Ronin, which was all but certain death with Mei Feng down to a few wounds. On the attack that should have killed her, though, my wife flipped the Black Joker for her Severe damage. I cheered and then, you know, died on the next hit from that Flurry. With Mei Feng down, I shuffled some of my bit players around to improve my counter charge. This let my wife heal everything via Vanessa, and with a decent flip that had Viktoria of Ashes back to 4 wounds. I burned Vanessa down after that, while the deadly Viktoria flock swept along the bottom of the table. My Rail Golem held his own against Taelor while a Railworker took a very overkill Dragon’s Bite. Despite the rough start, I revealed my Gathering Power Scheme. I’d placed a few scheme markers, which put me in a position to get on the board. Unfortunately for me, my wife had wisely selected Assassinate as one of hers, so she was sitting at 3 VP out of the gate. I’d completely forgotten Assassinate even existed! It sure would have been a useful scheme for me to take, given that I basically poured all of my resources into trying to do just that. My wife grabbed the last soulstone vein, which she was well-poised to employ given the multitude of henchmen on her side. The Rail Golem ultimately perished, but Burning did a ton of work for me in the latter phases of the game. Laying Burning on a target, following it up with the Emberling’s +2 Burning to a Burning target (with no defense possible!) and then using a Railworker’s Shovel Faster! to immediately inflict that Burning damage is a combination that can cut through a hard target very quickly. It–or versions with more Burning and less model interaction–killed Vanessa, chipped away at Hannah, ultimately wrecked Taelor, killed Viktoria of Ashes, and led to my victory by concession. Long game, with a ton of reversals and surprises. I was stuck with the Black Joker in my hand for a while, and all told we saw four Red Jokers and three Black over the span. I’m definitely impressed with the Rail Crew’s staying power, though I think I’d have fared far worse if I’d been facing 3 Ronin instead of just the one. Mark of Shez’uul is also terrifying for my Railworkers, since they only have 4 wounds and rely on their defensive traits to keep in a fight. Viktoria of Blood can basically kill one a turn with minimal effort. Due to getting in on the Easter sale, I have Tara’s full crew in translucent smoke, and my wife’s been asking to see that on the table. That gives me time to get the long-awaited Troubleshooters kit assembled, which will give Mei some competition in the melee department. 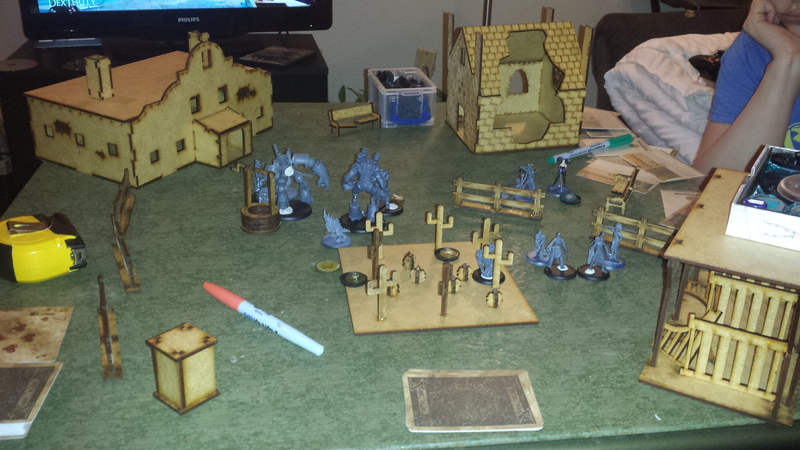 Posted in Battle Report, Malifaux.Tagged Arcanists, Battle Report, Foundry, Malifaux, Outcasts, Viktorias. Abilities that do not specify an end time always go away at the end of the turn. I’m not a fan of hitting the Rail Golem with burning attacks as I find that it picks up enough burning from its own abilities and, even though it is quite tough to kill, I don’t like wasting my AP putting damage on my own pieces unless it is necessary. More to the point, the use of burning is usually limited by my tomes in hand more than the number amount of burning on the Golem. Your attack with Mei Feng on Vik of Ashes in game 2 was laudable, and I think probably it was the right choice considering the strategy. I actually find her more effective bullying small groups of cheaper minions and leaving your own heavy hitters to take on (or delay) the master of the other crew. I recommend Mrs Egopoisioning swap around her upgrades a little. Vik of Blood does’t really want to be wasting her AP casting Sisters in Fury when she could be killing stuff, so that would be most effective somewhere else (I like it on Vik of Ashes, but I’ve tried it on Vanessa and liked it there too). I prefer Sisters in Spirit on Vik of Ashes too, as it works so well in combination with Synchronised Slaying to set up a frankly hilarious slingshot where you can kill off almost any model or cluster of models in the game. This goes even more if you put Oathkeeper on Vik of Blood to give her a ludicrous 4 high accuracy attacks with minimum damage 5 that ignore just about every defensive ability. Thanks for the comments (and the read)! I passed the recommendations, and joyous news of Kang’s less-than-uber power to the Missus; she was especially thrilled by the latter. I’m sure Mei is great on small groups, especially with that other trigger off Seismic Claws; I’ve got a game later this week with not-my-wife, and I think it might feature armies that put a few more small bodies on the table, so I may get to try that. Where burning’s concerned, I figured minimal damage from two Fire Gamin would pay off bigger than letting them swing individually. I prefer the Gamin shooting to either option, but once everyone’s in a scrum, or against blast-resistant folks like Hannah, it’s an option I want to tactically explore. Won’t cost me any tomes, either! But it could be that something in my Rail Golem’s playing differently than your experience, because I’m only seeing the one a turn. I managed to get the defensive trigger off once, but that’s because he’s died pretty quickly in both engagements. Previous Post Homework, Sure. At Least There’s Not a Quiz. Next Post Prime Time Picture Dump!